Advantages: Good coverage of F-86K, both history and service. Having noted in the HyperScale's "What’s New" Page for 19 July that Special Hobby plans to release an F-86K Sabre in 1/72 scale in the near future, it was timely that this latest volume from AirDOC arrived for review. The F-86K is an interesting subject, being a somewhat neutered version of the F-86D, with the fire-control and rocket launcher systems replaced by a simpler system with four 20mm cannon. In this volume Wache traces not only the history of the K model, but also the D, giving the reader the requisite understanding of the evolution of the family as a whole. I always find this a nice addition to a service history as it fills the blanks in the reader’s knowledge of a type. 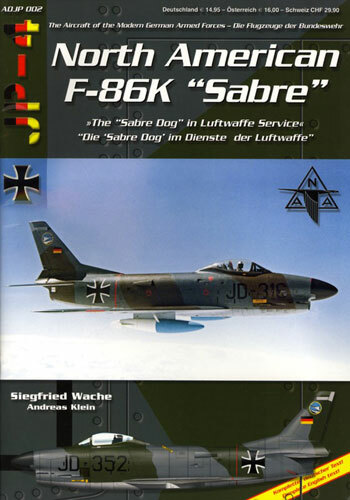 Unfortunately for fans of the Sabre family, this branch only saw limited service with the Luftwaffe. Whilst more units were planned, eventually only one Jagdgeschwader (JG74) was equipped. There are many reasons for this but undoubtly the choice of the F-104G for the Luftwaffe’s next fighter was probably the major contributor. After being declared to NATO in October 1962, it was less than four years later that last flight in Luftwaffe service occurred. Despite this it managed to wear some attractive schemes, with colourful staffel markings on both the natural metal delivery scheme and later camouflage scheme. 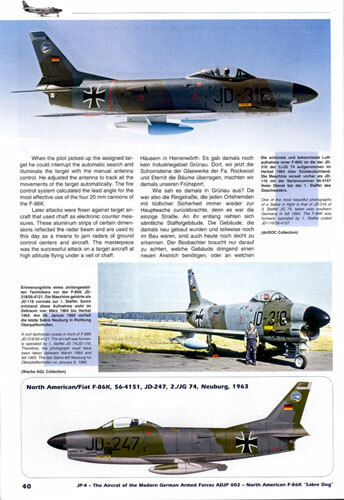 Up until now modellers have had several new F-86D kits in 1/72 and 1/48 scale, but unless Hasegawa retools its F-86D, there is unlikely to be a better F-86K than the forthcoming Special Hobby kit. With a Luftwaffe option among those planned for this release, a modeller could do a lot worse for themselves than seek out this volume as a reference.